Posted on April 12, 2019 by J.T. In the modern world, we rely on electricity to power our homes and businesses. But while most of us feel like we couldn’t do without electricity, this source of power can often be a dangerous one. That’s especially true when power surges come into play. Electrical Safety Foundation International defines a power surge as “a sudden and unwanted increase in voltage that can damage, degrade, or destroy the sensitive electronic equipment in your home or business.” In the case of electricity, there can definitely be too much of a good thing. When voltage delivery exceeds a certain point (typically, 169 volts), this can be too much for your devices to take. This surge can result in excess heat being generated in the arc of electrical current within an appliance of device, which can cause significant damage to the internal electronic components. Some estimates suggest that power surges cost $26 billion a year in lost time, equipment repair, and replacement costs. What’s more, power surges may be much more common than you’d think. You may not even realize they’ve happened until you take note of poor device performance. One survey conducted by the National Electrical Manufacturers Association found that 41% of participants reported damage or catastrophic failure of electrical or electronic equipment due to a voltage surge or lightning event. If you fail to protect your devices from the start, you could be faced with the possibility of lost data or the need for expensive device replacement. It may help to gain a better understanding of what exactly causes these voltage spikes. There are three main causes of power surges: internal overvoltage operations (like electrical load switching), utility company issues (such as downed power lines or increased power demands), and natural events (like lightning strikes). Some of these instances are more common than others, but all have the power — literally and figuratively — to cause lasting damage. Roughly 60-80% of power surges are caused by events or problems within the home where the electrical and electronic equipment are kept. When a large appliance (like an air conditioner) turns on and off, this can result in a potentially damaging power surge. Wiring issues within the home can also lead to power surges. In addition, utility company problems can cause voltage spikes. A downed power line, for instance, or a blown transformer can lead to power surges, as can increased demands for electrical power during the summer and winter. And then there’s the risk associated with lightning storms. Although power surges attributed to lightning are relatively rare, accounting for only 2% of all power surges, these events can still be very catastrophic. Lightning actually strikes the earth roughly 100 times per second, according to the Insurance Institute for Business and Home Safety. When lightning does strike, it can create some of the most powerful surges of all. Your homeowners insurance may or may not cover the costs associated with power surge damage — but even if they do, you’ll want to be proactive about protecting your electronic devices and household appliances. By investing in high-quality surge protectors, you can divert these power spikes away from your household devices and safeguard them from damage. Posted on April 9, 2019 by J.T. One of the reasons why we love technology is that there’s always some new and exciting development. Of course, that can be frustrating for some people — especially when the latest advancement seems unnecessary, doesn’t live up the hype, or actually causes more problems than it solves. The jury is still out on whether wireless charging will really catch on a widespread level. Though it might sound like a great invention in theory, it may still have a long way to go in practice. Let’s take a closer look at the main pros and cons of wireless charging — and why you won’t want to get rid of your cables for cell phones and other devices just yet. It’s convenient: It’s hard to argue that having a way to wirelessly charge your phone or other device is incredibly convenient — and that’s something that tech-lovers are drawn to more than almost anything. Although you do need to plug in the charging station itself, you won’t have to worry about plugging in your phone, tablet, or other device or misplacing your cell phone cables. That said, you’ll still need to carry around the actual wireless charger with you if you go somewhere — so it’s really only convenient if you plan to charge in one general location (like at home or the office). 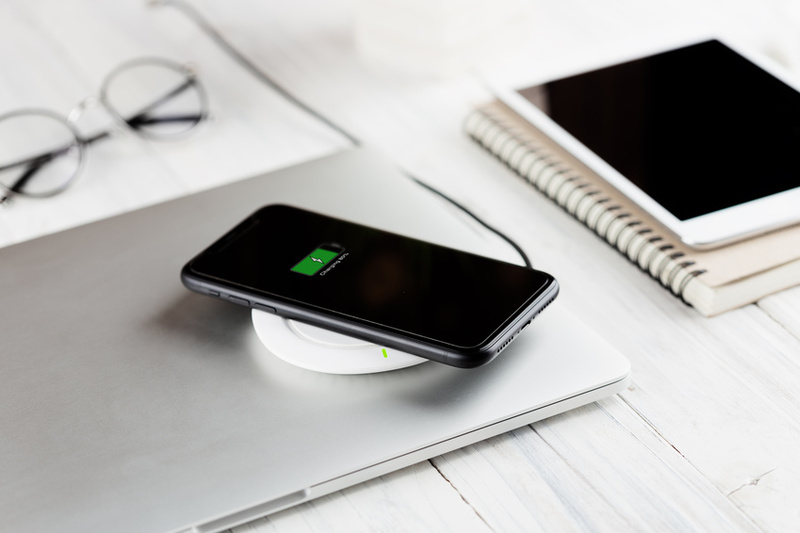 It’s versatile: One benefit wireless charging can provide is the ability to charge a number of different devices, either individually or all at once. That’s not something you can do with a conventional charging cable. In that sense, you’re really investing in several different charging solutions in one, without any of the mess that comes with cables for cell phones, tablets, and other devices. Because the wireless charging station can seamlessly integrate with all kinds of phone versions and brands, you won’t have to worry about having the right cable to fit the right type of port. That said, some people have noted that wireless chargers can have incompatibility issues with certain types of phones, meaning that they might not always be as versatile as you’d think. What Are the Drawbacks of Wireless Charging? It’s inefficient: A main disadvantage of wireless charging is that it’s actually pretty inefficient compared to traditional charging. Not only can you not use your phone while it’s charging, but you’ll also wait a lot longer to obtain a full charge. Experts recommend that you charge your phone when the battery gets down to 35% or 40%. Some people estimate that using a wireless charger will take anywhere from 30% to 80% longer to completely charge a device than what you’d experience when you use a conventional cell phone charging cable. If you don’t like waiting around (and who does? ), you’ll be better off if you charge your phone the old fashioned way. It’s expensive: Even the highest quality cables for cell phones are fairly affordable. But wireless charging isn’t exactly accessible to the masses. They can cost up to $100 in some cases, which is a substantial investment to consider on top of the costs of your phone, case, and other accessories. While one would hope you never have to replace an expensive wireless charger, it’s important to note that the technology is still new. If you invest in one of these chargers now, there’s a good chance that the technology will improve pretty soon — and then you might end up wasting money on an inferior product. If you don’t mind spending a pretty penny on your charger, it might not be a big issue. But there’s no doubt that cables for cell phones are a lot more financially feasible. Wireless charging technology might seem enticing, but the reality is that the quality of your charging experience will suffer if you invest in this option. For most people, traditional charging cables are still the way to go. To learn more about our cell phone cable options, feel free to peruse our website or contact us today for further information. Posted on April 5, 2019 by J.T. Many of us rely on USBs (that’s short for Universal Serial Bus) to allow one device to communicate with another. We use USB cables and connectors to charge our phones, transfer data, or to connect our mouses and keyboards to our computers. The good news is that we’re continuing to improve upon USBs, as well. While USB 2.0 cables and compliant devices can reach a maximum transmission rate of 480 Mbps, the newest USB cables and compliant devices can theoretically offer much faster speeds and better reliability. Still, that doesn’t mean that the technology — or our use of it — is perfect. In fact, you might be making some mistakes with your USB use that can be easily rectified. But if you don’t follow these tips, you could become extremely frustrated or even risk damaging your devices. 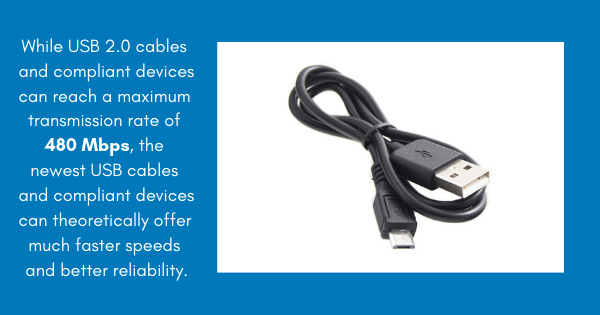 Here are just a few mistakes you’ll want to avoid when working with USB cables and compliant devices. Given the fact most of us can’t stand the thought of being caught out of the house without our mobile devices, it’s no surprise that the majority of motorists have a car charger in their vehicle at all times. But you probably haven’t given much thought to the quality of that charger — especially since they’re often available for affordable prices in gas stations and convenience stores. Using a low-quality or incompatible car charger might mean that it’ll take a lot longer to charge your device. In some cases, this could actually damage your phone. Make sure to do your research and buy USB cables and chargers from reputable brands and sellers that are compatible with your device. If you’ve tried to plug in a USB drive or device into your computer and have gotten an error message, it could be due to an issue with the drive itself or with your device. In some cases, the drive may be corrupted or unstable in some way — this could happen if you’ve purchased a poor quality drive or it’s been damaged. It’s also possible that your computer may need updates (or that its recent updates are no longer compatible with your USB drive). You may be able to fix the issue by uninstalling and reconnecting your external hard drive or by resolving computer-related issues. But it’s also possible that you may need a higher quality external drive or have an incompatibility issue between the drive and the main device. A lot of people are quick to blame a faulty USB port in their computer or other device when the connection isn’t working. While this certainly could be the case, it may also be something much simpler. USB cables are more likely to fail than the port is, especially if the cables you’re using aren’t exactly the best quality. You can check to see whether the cable might be the cause by plugging in the cable to another USB port on your computer or on a different device altogether. If none of these connections are successful, it’s very likely the cable’s fault. Fortunately, it’s easy enough to find a replacement that won’t bail on you when you need it most. Whether you need the best USB 3 cables on the market or want to invest in some replacement charging cables for your phone, we’re here to help. For more information on our various products, please contact us today. Posted on April 3, 2019 by J.T. Cell phones are all around us. Though they’re more like miniature computers than anything else, they’re how we communicate with our friends and with the world. So when we see that battery percentage drop, getting to a charging cable becomes the most important thing in the world. But what if your cell phone cables are broken? Broken or worn out cell phone cables can be a huge pain. If you’re ready to learn how to take care of your cables, keep reading. It’s easy to crumple up your cell phone charging cable and shove it in your bag, pocket, or glove compartment. While this might be the most convenient manner of storage, it’s definitely not good for the lifespan of your charging cord. When you need to pull it out of that space and inevitable untangle it, you’re risking a lot of damage. Instead of shoving your charging cable into the first open space you find, make sure you’re coiling your cable before storing it away. Securing your coil with a small clip or twist tie can help prevent tangling, as well. Whether it’s USB cables, ethernet cables, or cell phone charging cables, proper coiling is essential to extending their lifespan. After you’ve finished charging your phone, don’t crumple your cable or scrunch it up. Instead, wrap it gently around your hand with the natural curve of the wire. After that, you can secure your coil with a clip or a twist tie. This way you’ll avoid any excess tugging, tangling, and damage to the outer coating (and inner workings!) of your cables. We’ve all charged our cell phones at awkward angles. While this is a common phenomenon, it’s not a healthy one for our charging cables. If your outlet is in a place where your charging cable needs to pull at a sharp angle to reach your phone, you’re risking damage to the cord. As much as you can, charge your phone on a flat surface where the outlet is as level to your phone as possible. Considering that roughly 400 iPhones are sold every minute, cell phone charging cable horror stories are quite common among Apple users. If you want to keep your phone charging cable in prime condition, make sure you follow these tips. Surge Protectors: How Old Is Too Old? Posted on March 29, 2019 by J.T. Surge protectors are everywhere. In fact, the Electrical Safety Foundation International recommends them for equipment safety. 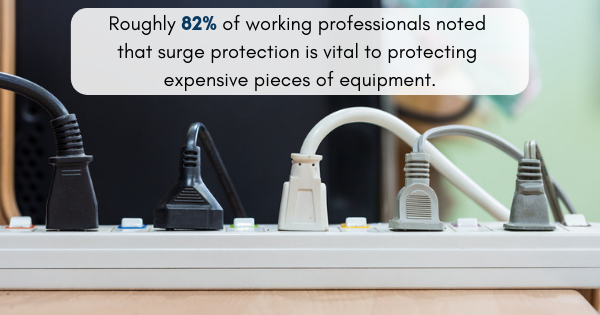 In one of their surveys, roughly 82% of working professionals noted that surge protection is vital to protecting expensive pieces of equipment. However, that doesn’t mean one surge protector is going to last forever. In fact, we’re going to tell you why surge protectors for computers, servers, and other pieces of equipment need to be replaced periodically. How old is too old? Keep reading to find out. How long is the lifespan of a surge protector? If you’re looking for a length of time, that’s unfortunately not how surge protectors work. Power strip surge protectors and the like measure their ability to protect in joules. So if your surge protector can protect your equipment up to 1,000 joules, you’ll need to replace it after it has absorbed that much power. So the age of your surge protector doesn’t necessarily matter. What if I have a really old surge protector? Of course, age isn’t totally out of the picture when it comes to surge protector risks. While HMDI cables and USB 3 cables (which can transfer at 10 Gbps) may show their age, that isn’t always the case with surge protectors. If your surge protector is 10 years old and gathering dust and other things, it could potentially pose a fire hazard. Not only are older surge protectors potentially less effective at protecting your equipment, but older equipment is also more likely to have technical deficiencies. Loose screws, frayed cables, and any other number of hazards could cause more than your computer to shut down. How can I tell if my surge protector needs to be replaced? The best way to tell whether or not surge protectors for computers need to be replaced is to purchase protectors with built-in warning systems. These systems are usually lights that come on when your surge protector is no longer effective. These systems aren’t always 100% accurate, but they’re important and can often let you know when it’s time to shop for a new surge protector. Are your surge protectors no longer protecting your equipment? If you’re concerned about their effectiveness, it’s likely time to make a chance. Make sure you’re considering more than their age when you’re considering replacing them, as well. Posted on March 26, 2019 by J.T. 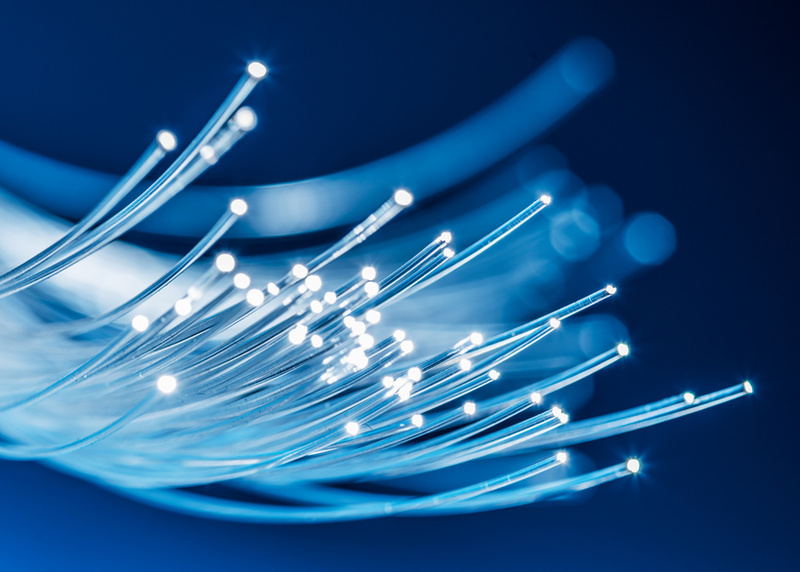 The very first fiber optic cable was used in 1988 to connect the U.S. to France and Britain. Since then, countless more cables have been installed all over the globe and are now one of the most popular types of long-distance networking cables available. Speed — This is perhaps the main advantage of making the switch to fiber optics. Since fiber optic networks operate at speeds into the gigabits, users can navigate the web faster than ever before. Distance — With fiber optics, signals can be transmitted much further without needing to be strengthened or refreshed. Bandwidth — Another major advantage of using fiber cables involves bandwidth because of their large carrying capacity. Maintenance — Despite all these benefits, fiber cables are actually much more affordable to maintain. Resistance — Fiber cables offer greater resistance to electromagnetic noise coming from nearby cables, motors, and radios. Fiber Optic Connector — An optical fiber connector terminates the end of the cable and enables faster connection and disconnection than splicing. The connectors mechanically couple and align the cores of fibers so light can pass through. Media Transfer Protocol and Multi-fiber Push On Fiber — Media Transfer Protocol (MTP)is an extension to the Picture Transfer Protocol (PTP) communications protocol that allows media files to be transferred atomically to and from portable devices. Multi-Fiber Push On (MPO) is a connector for ribbon cables with four to 24 fibers. If you want to buy bulk fiber optic cables or ethernet cables, give CableWholesale a call right away. Posted on March 18, 2019 by J.T. We rely on our gadgets for virtually everything. With more than 3.74 billion worldwide internet users in 2017, we use our smartphones, computers, tablets, and other technological devices to stay in constant contact with others both near and far. In times when we are unable to use our gadgets — like in the event of an equipment failure, a poor internet connection, or battery drainage — we realize just how important our technology is to our ability to operate. If you allow your laptop to be negatively affected by a power surge, for example, you’ll certainly come to regret your failure to adequately prepare and to protect your device. Let’s take a closer look at what might occur if you don’t take steps to prevent the negative effects of power surges. What Can Happen to Your Laptop During a Power Surge? Surge protectors for computers and other devices are used to divert excessive electricity during spikes or surges. This will subsequently keep your devices from being harmed. But if you do not use a surge protector, here’s what can occur. Your charger or battery might become damaged: In order to operate properly in the long term, your laptop computer needs to be able to have its battery recharged and be able to maintain a charge when not plugged in. Unfortunately, a power surge can render your charger and/or your battery fairly useless. Your battery may no longer take a charge, may require substantially more time to charge fully, or may exhaust its battery charge more quickly. These problems could be attributed to failures within the charger or within the battery itself. When you charge your phone or computer during a power surge, you’ll absolutely want to use a power strip surge protector to ensure you can continue using your gadgets in the aftermath. Your laptop may not power up: During a power surge, it’s possible that your laptop’s motherboard could be hit by excess electricity. If enough electricity is directed to the motherboard, your laptop might fail to boot up at all. Basically, that means that the interior of your computer won’t work as intended. That will make it impossible to use your device or access any information stored therein. If you’ve failed to back up your computer or are in the middle of a task, you will likely lose your ability to open or complete documents and files until your computer undergoes a replacement (which may be incredibly costly). Your hard drive might become sluggish: In addition to damage to your motherboard, it’s also possible that your hard drive could be harmed due to a power surge. 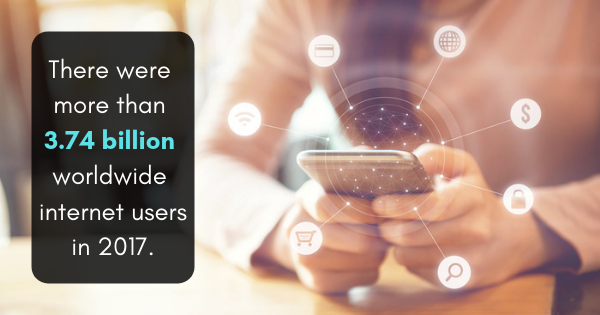 In some cases, this could mean permanent loss of data, but it could also translate to other ongoing issues that make it difficult for you to use your device. For example, it could significantly slow down your system, cause your computer to take longer to power up or to open applications. You may be completely unable to open certain files. This can present a minor convenience or a major upheaval, depending on the circumstances. If you don’t want to risk these outcomes, you’ll need to take steps to safeguard your laptop from harm. In the event of a surge or a spike, a surge protector can ensure that electricity is directed away from your devices and thereby ensure their inner workings are kept intact. It’s an incredibly simple and passive way to continuously make sure your technological investments aren’t ruined by a natural event. To learn more about these protective tools or about the other cables that can make your life a whole lot easier, please contact us today. Which Type of USB Cable Is Right for You? Posted on March 14, 2019 by J.T. In 2016, 45% of the Earth’s population used the internet, and as of that year, 3.5 billion people around the world were internet users. Because most of the electronic devices we use involve different types of USB cable connections, it’s important to understand the different kinds of USB cables that are available, as well as what their purpose is. According to MakeUseOf, each cable type performs different tasks in order to retain compatibility and accommodate new devices. Before you buy those bulk USB cables, here’s what you need to know about each kind. This is the flattened, rectangular-shaped interface at one end of almost any USB cable. They can be found on TVs and other devices such as game consoles. USB Type-A Cables can only be inserted in one way. These cables are mainly used with printers and other types of powered devices that plug into computers. This type of cable isn’t very common anymore because the majority of electronic devices have updated to accommodate smaller connections. Before micro-USBs were developed, the Mini-USB was a smaller type of connector that was standard for use with mobile devices. You can still find these occasionally on cameras, MP3 players, and similar electronic devices. Smaller in size than mini-USBs, Micro-USBs are currently the standard for both portable and mobile devices. 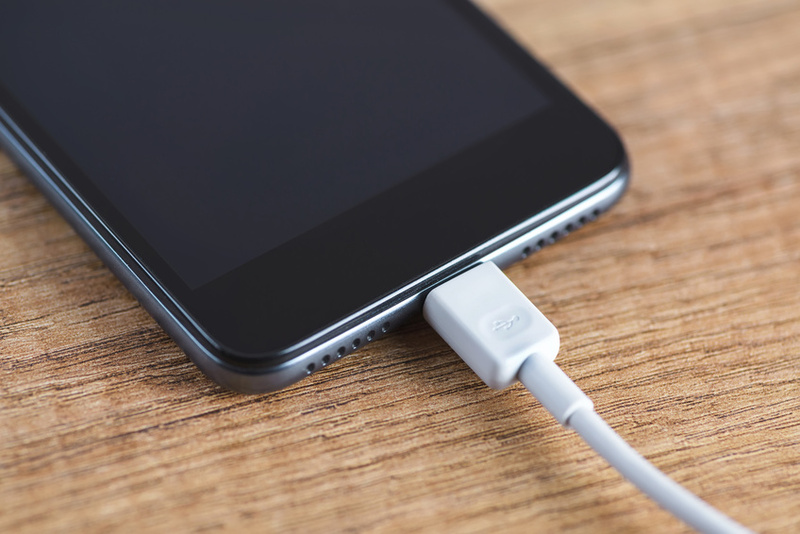 Although they can still be found on many types of tablets, smartphones, game controllers, and USB battery packs, some have begun to switch to the USB Type-C cable. These reversible cables are the newest USB cables. 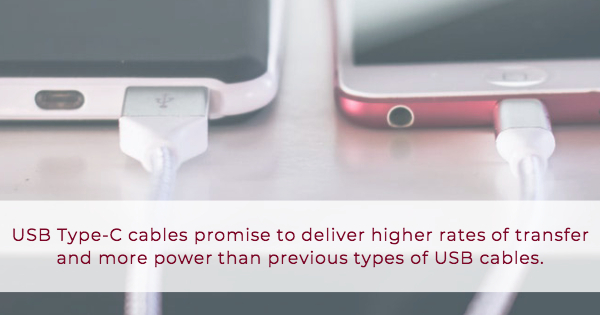 They promise to deliver higher rates of transfer than previous types of USB cables, as well as more power. In addition, they have the capability to perform multiple functions. USB Type-Cs can be seen on many of the newer laptops and smartphones, such as Pixel phones and the MacBook. This isn’t considered to be a true USB standard. However, it is the proprietary connector for Apple’s iPhone, AirPods, iPad, and other devices. Comparable in size to the USB Type-C cables, it is also standard on all Apple devices that have been released since September 2012. Apple devices that are older than this use a significantly larger 30-pin connector that is also proprietary. With a better understanding of USB cables and their uses, you’re ready to go out and buy those bulk USB cables with confidence. Posted on March 11, 2019 by J.T. If you’re obsessed with watching all the latest offerings in entertainment, you’ve probably invested in your fair share of HDMI highspeed cables. After all, they’re the technology that allows both sound and picture to be communicated through one cable. But how can you know whether your HDMI cables are letting you down? HDMI 2.0 hardware supports bandwidth of up to 18Gb per second, but a worn-out cable won’t be able to transmit much at all. Here are a few signs that your highspeed HDMI cables might need to be replaced ASAP. The sound is inconsistent: If the sound of what you’re watching frequently cuts in and out, your HDMI cable might be to blame. Assuming you’ve ensured there are no tangles or kinks in the cable, it’s one of the first indicators that you may need a new cable. The picture is fuzzy or the resolution is poor: If you have a state-of-the-art TV but the picture quality is subpar, it’s entirely possible your HDMI highspeed cables aren’t working to their full potential. That’s especially likely if you’re relying on an older cable but your device is relatively new. And if the picture also cuts in and out, it’s time to take a closer look at the cable. There’s no sound or picture: A complete absence of sound and/or picture probably isn’t a good sign. It could point to other issues too, but if you know your TV is in good working order, it’s more likely that your cable is acting up. While there could be other issues at play, you should check to see whether there are any bent or broken pins within the mouth of the cable itself. This can tell you right away that you’ll need to start looking at replacement HDMI highspeed cables. Your TV inputs work fine: Sometimes, a poor quality picture isn’t due to a faulty cable. It could simply be that one of the cable inputs on the TV itself may be damaged. If your device has several of these cable inputs, test them with your existing cable. If the problems seem to go away entirely, it’s a problem with the device. But if the same issues persist even after testing the other connections, it’s probably your cable’s fault. Once you purchase a new HDMI cable, you’ll be able to test your theory once and for all. If you need help selecting a new HDMI cable or fulfilling your other cabling needs, please contact us today. Posted on February 15, 2019 by J.T. Our connection to the internet is considered by many to be a sacred one. 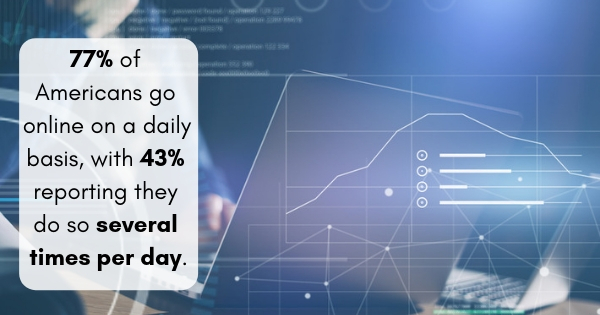 After all, 77% of Americans go online on a daily basis, with 43% reporting they do so several times per day. But when it comes to how we get online, we don’t always agree. Some depend on wireless connections to surf the web, while others opt for Ethernet. If the latter is more your speed (and why wouldn’t it be, since it’s faster than a lot of other connections? ), you have a few different types of cables to choose from. In today’s post, we’ll be discussing the pros and cons of the Category 5 cable, also known as Cat5, to help you determine whether it’s the right type of cable to fit your needs. The Category 5 cable is one of the most versatile options at your disposal, allowing for more flexibility in terms of both wiring and usage. In other words, it’s extremely easy to install and use. You don’t need any special tools for the job, which means you can connect to the internet quickly and without frustration. This category of cable is actually two cables in one: it can connect a wall socket with a central panel and a computer with a wall socket. It’s also one of the most affordable cables for Ethernet access and provides a lot of value for the cost. For home applications, this cable also provides fairly high transfer speeds, which is appealing to many people who are fed up with their slow internet. Of all the categories of Ethernet cables available, the Cat5 isn’t the newest one available. It’s also not the absolute fastest, as Cat5e cables and Cat6 Ethernet cables are able to provide more rapid connections. It won’t provide you with the most impressive way to transfer data, either; it’s a bit more limited than subsequent cable categories. While that’s fine for the typical home user, it’s not always the best option for big corporate networks. It’s also important to note that this type of cable is more sensitive to interference than other Ethernet cable options, which could disrupt your transfer speed or signal strength. Again, that may not be an issue for the regular residential user — but if you’re an avid gamer or there will be multiple people relying on this Ethernet connection, you may want to explore some alternatives. Ultimately, the Cat5 cable is a dependable go-to for residential use. It may not be the flashiest cable around, but it gets the job done in a variety of instances. Although it’s not the ideal choice for commercial use and isn’t the newest type of cable available, it’s still regarded as one of the most versatile and affordable Ethernet cables on the market today. To learn more about our different types of cables and how they can make your life a whole lot easier, contact us today.